More than 80 educators who have received grants and awards from the La Crosse Public Education Foundation in the past year were honored Jan. 22, 2018, at LPEF’s annual Grants Award Luncheon. Festival Foods is the presenting sponsor of the Grants Award Luncheon. 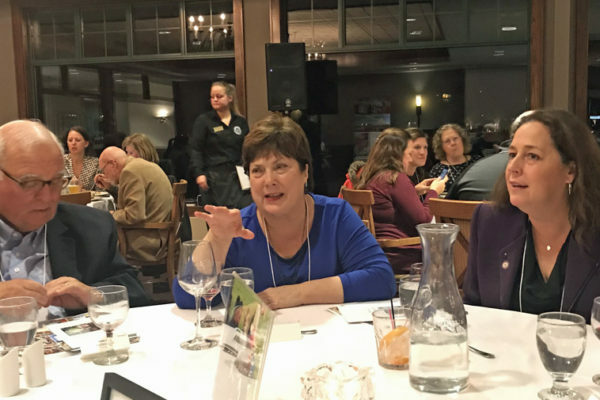 About 270 people, including award winners, District staff and community members attended the festive event held in the Cargill Room at The Waterfront. The theme of the 2018 event was “Community Schools: Engaging Families, Meeting Needs.” Attendees heard from Superintendent of Schools Randy Nelson and learned how the Community School concept will help Northside Elementary and Hamilton Elementary enhance student learning by developing supports for children, parents, families and community members within the school neighborhood. The Board of Education has approved funding for Community School Coordinators at each school, with programming expected to start by summer 2018. The LPEF Board has approved start-up grants to each school in the amount of $7,500. 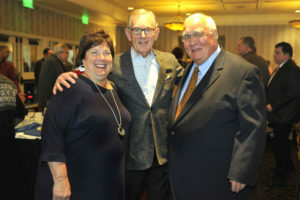 Dave Skogen (center), chairman of Festival Foods, congratulates Judy and Tom Sleik for winning the Margaret Dihlmann-Malzer Distinguished Service Award. Corporate Partner in Education — Coulee Bank for its long-standing support of LPEF and other children’s charities. 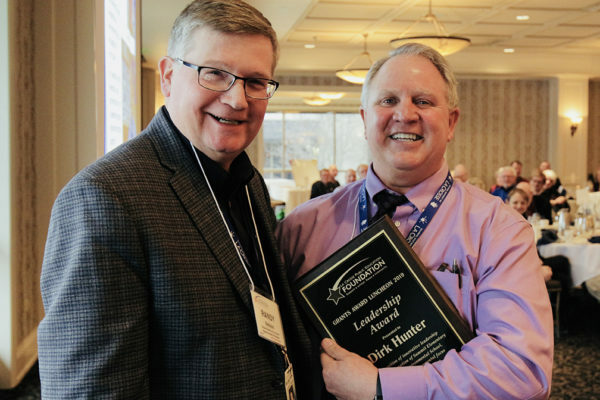 Leadership Award — Joe Ledvina, the District supervisor of buildings and grounds, for his diligent work on behalf of taxpayers and his support of LPEF. 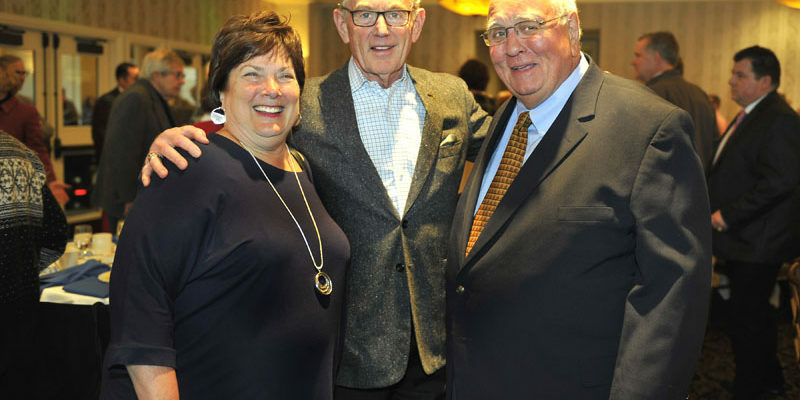 Margaret Dihlmann-Malzer Distinguished Service Award — Tom and Judy Sleik, longtime volunteers and former board members of LPEF. For more information on the special award winners, please see: Celebrating our volunteers and partners. VIEW PHOTO GALLERY from the 2018 Grants Award Luncheon, with photography by Diane Gebhart. Superintendent of Schools Randy Nelson provided the gathering with an overview of new Community School programs being launched at Hamilton and Northside elementary schools. LPEF is providing $7,500 grants to each school for start-up funding for school resource rooms. 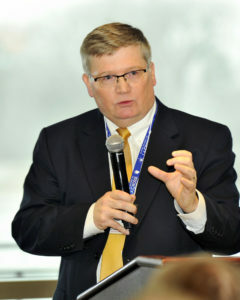 Superintendent of Schools Randy Nelson filled in for the featured speaker, who was unable to attend due to bad weather. 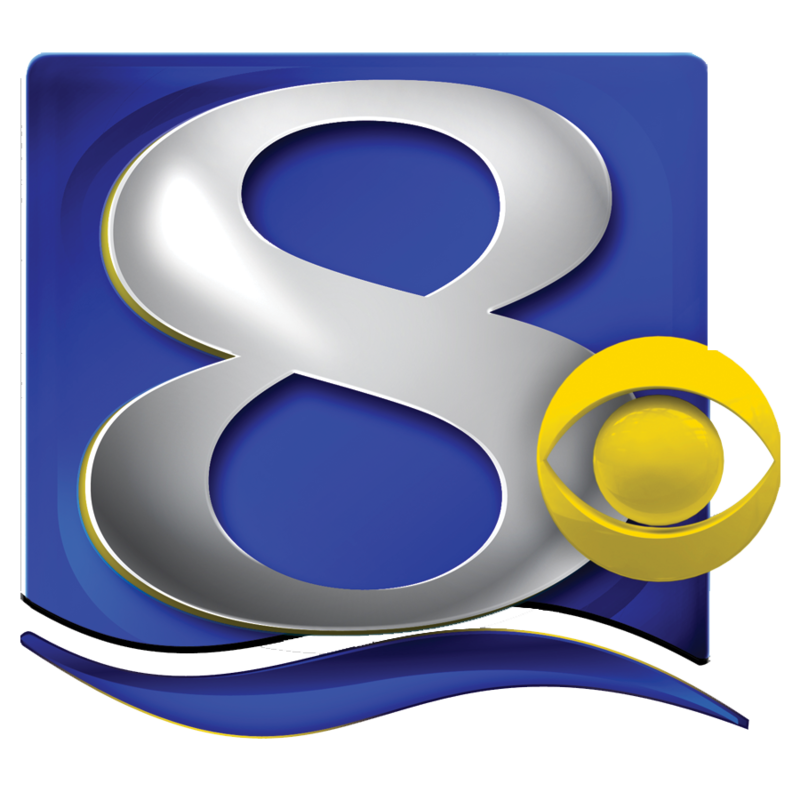 Nelson provided an overview on the launch of Community Schools, and he introduced an “Assignment Education” video news story from News 8 WKBT’s Lisa Klein focused on the topic. Two retired educators were saluted during the ceremony, with special support from Fowler & Hammer. Both teachers were known by their colleagues for their dedication to the students and to providing a high-quality learning environment in their classrooms. Susan Paudler retired in June after 34 years of teaching in the District, most recently as a 2nd-grade teacher at Emerson Elementary School. Terri Johnson retired in June after 33 years of teaching in the District, most recently as an 8th-grade social studies teacher at Lincoln Middle School. In honor of Susan, a grant was awarded to former Emerson colleagues Nancy Wettstein-Weaver and Alicia Place, helping buy sensory floor tiles. These colorful mats contain liquids that move in response to pressure, and will provide a “think spot” for students. In honor of Terri, a grant was awarded to social studies teachers at Logan Middle School, Kristi Moulton, Christina Fenton, Jesse Martinez and Heidi Jones. They will buy two sets of novels to help students understand refugees and the various crises involving refugees around the globe. The La Crosse Public Education Foundation has been supporting La Crosse public schools for more than 29 years. 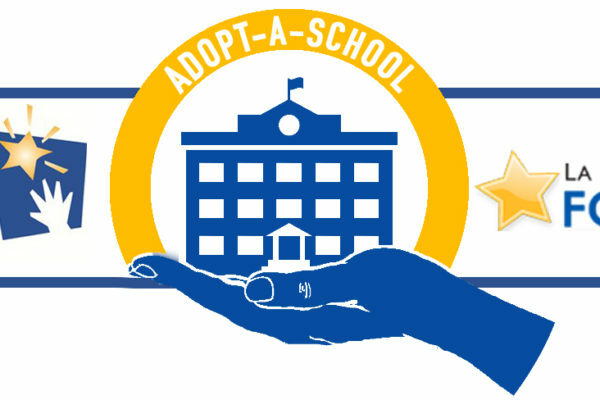 The Foundation provides classroom grants, staff development money and other support for students – funding programs and projects that are not covered by tax-dollars. In all, the Foundation expects to provide more than $200,000 in support this year to the School District of La Crosse. 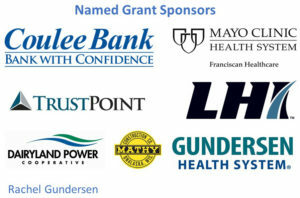 Named Grant Sponsors: Coulee Bank; Mayo Clinic Health System Franciscan Healthcare; Trust Point; LHI; Gundersen Health System; Dairyland Power Cooperative; Mathy Construction; and Rachel Gundersen. 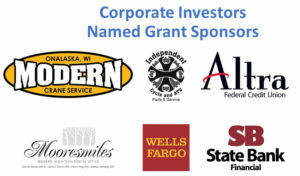 Corporate Investors/Named Grant Sponsors: Wells Fargo, State Bank Financial; Altra Federal Credit Union; Modern Crane Service; Independent Cycle & ATV; and Mooresmiles. Grant Sponsors and other Corporate Investors: First Supply/Gerhards; The Insurance Center. 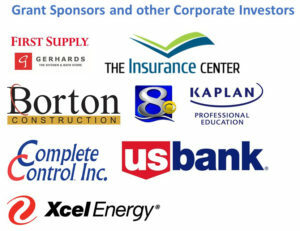 Borton Construction; Kaplan Professional Education; Xcel Energy; US Bank; Complete Control; and News 8 WKBT. Table Sponsors: Association of La Crosse School Administrators; Board of Education, School District of La Crosse; Johns, Flaherty & Collins; La Crosse Education Association; Fowler & Hammer; UW-La Crosse/UW-L Foundation; Viterbo University; Western Technical College; La Crosse Tribune; Hale, Skemp, Hanson, Skemp & Sleik; and McCabe Roofing. Teacher Sponsors: WIPFLI LLP; DeBoer Pest Control; Coulee Regional Mechanical; and Dahl Automotive.